Author’s note – the following post is not endorsed or in any other way associated with Sunbeam Foods. 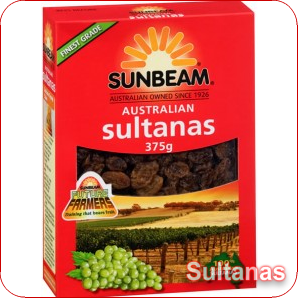 I merely chose the above picture as an example in case anyone about to read the following post is wondering what the heck a sultana is. We all have our pet peeves, and one of mine is people in the street who don’t pay attention to where they’re going. Like the group too engrossed in their conversation and taking up the entire width of a footpath as they move along at a snail’s pace. Or the person ahead of you, or coming towards you, with their head down while they focus on their smartphone instead of the route ahead. Or the other person – or sometimes the same person – lost in the music blaring through their headphones. I’ve even encountered someone who was exiting a lift I needed to get into…but because they were too engrossed in the newspaper they were reading, they took forever to get out (I almost tore the newspaper out of their hands and yelled at them to “MOVE IT!”) (Sometimes, I still wish I had). As a result, I always try to ensure that I never behave like that. When I walk, I walk in the Now – I focus on where I’m going to ensure that I don’t get in anyone’s way and that no one gets in mine. Sometimes, though, I take this too far. This is not a new problem. About ten years ago, I went to visit friends in another city. I caught the train to where they lived, did some shopping, crossed the busy main road at some traffic lights and walked to their place – where they greeted me with a puzzled query about why hadn’t I noticed them only a few minutes before, in their car right next to the crossing I’d used, where not only had they called out to me several times in vain, but also a fellow motorist in the car beside them with his window down commented that mentally I was very far away. I honestly hadn’t noticed them at all. …but a couple of hours later when I logged into Facebook, I found a message from a friend who had also been at the station at the same time, who not only had called out to me a few times as I went past but was also wondering if I was pretending to ignore her so I could turn around a moment later and spring “Fooled you!” on her. I hadn’t, though, because yet again I honestly hadn’t noticed her at all. A week later at my next session with the psychiatrist, I told him about that incident (and that other one from my past) as a humorous observation about how I need to become more aware of my surroundings. He agreed – and then he proposed an interesting experiment for how to do this. He was inspired by the previous episode of the current TV series Making Australia Happy, in which eight volunteers undergo various experiments related to the science of positive psychology to improve their happiness and well-being. Although my psychiatrist was smiling as he told me about it, he was dead serious. When I asked him what was the point of all that, he explained that it’s an exercise designed to help you become more aware of your surroundings – as you spend all that time slowly chewing on the sultana and rolling it around in your mouth, you also start to take more notice of what you see and hear all around you. At first, I was incredulous…but then I thought about it, and I became intrigued. So, I said that I’d give it a try some time during the next week, and at our next session I’d report to him about the outcome. I’ll also report my findings here, so unless something else of burning importance happens first, the next post you should read here will be about what it was like consuming one (1) sultana for ten (10) minutes. Thanks for this. And thanks for the link to the making Australia Happy Website. I managed to only catch one episode of the show and really wanted to know more.